Sir Matt Busby once said that Jimmy Murphy was his first and best signing for Manchester United. The playing career of both Murphy and Busby ended prematurely because of the war. According to Stephen Morrin’s book The Munich Air Disaster , the 25-year long partnership between Murphy and Sir Matt Busby came about in 1945. Sergeant Jimmy Murphy and Company Sergeant Major Matt Busby shook hands in Bari, Italy after Murphy’s passionate and enthralling oratory skills impressed Busby and he asked him to join him at Manchester United. – Sir Matt Busby recalls the first time he heard Jimmy Murphy giving footballing lessons to a group of soldiers on the finer points of football tactics. 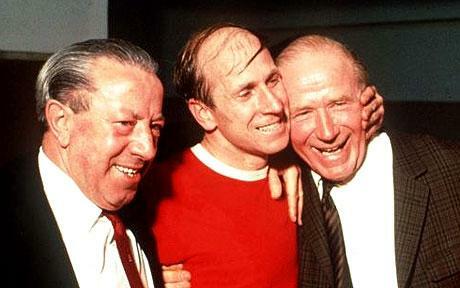 What a great signing it was from Sir Matt Busby! Jimmy Murphy was a great servant for the club and following the Munich Air Disaster, he carried the club back from the ashes against all odds. He uplifted everyone around him with his exceptional oratory skills and the ‘Never say die’ attitude that we all know exists at Manchester United. Here are a few other quotes about Jimmy Murphy from other big names in the footballing world. “Jimmy Murphy has never been given the accolade he deserved for enabling Manchester United’s revival. He was destined to live in Busby’s shadow but there is no denying the debt Sir Matt and the club owed him even though today he is sometimes forgotten by revisionist historians.